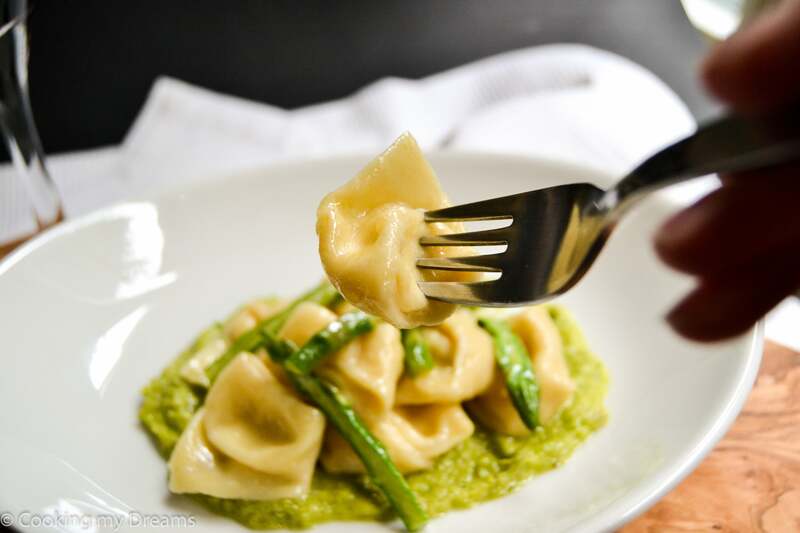 Cappelletti are a typical stuffed pasta from the region of Emilia Romagna, not to be confused with the classic Tortellini which are smaller and have a different filling. The name means literally “small hats” because of its shape and are traditionally stuffed with ground meat and served with meat broth (usually capon), especially on Christmas day: the women of the family spend the morning making the fresh pasta and the broth and serve it to the whole family on Christmas lunch. 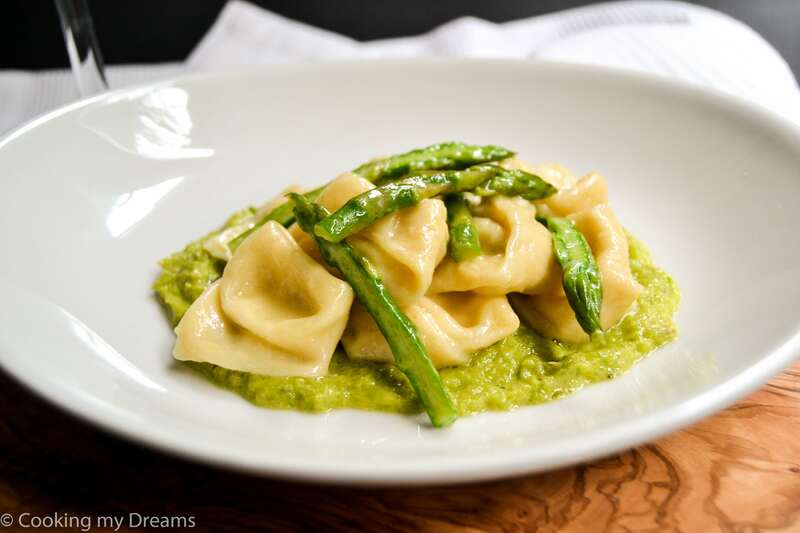 This is a spring edition to enjoy this lovely kind of pasta all year long. Rather than filling it with ground meat, I decided for a delicate filling of Ricotta and Parmesan cheese. 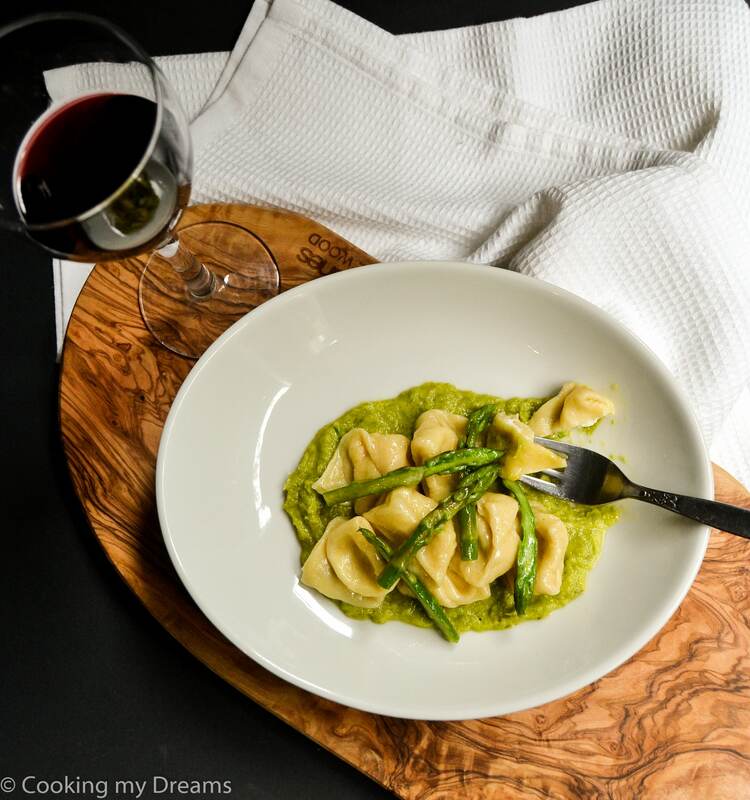 The Parmesan cheese gives it that extra taste and salinity, which as a result, complements perfectly the creamy asparagus sauce. When the days start to get longer and warmer, one of the first things that I think of is “it’s asparagus season!”. In Tuscany I used to go hunting in the woods for wild asparagus. It’s like treasure hunting, you have to look under the spiky bushes to find the treasure: a green, long, wild asparagus. They’re lovely with pasta or with eggs and the satisfaction of finding them yourself gives it an extra taste! The Parmesan cheese must be of good quality in order to enhance the flavors and give the right balance in the filling, otherwise you’ll end up with a blend ricotta filling. I used Parmigiano Reggiano DOP (here I can only find the basic aged 12 months, but if you can find it aged for 24 or 30 months I highly recommend it. It will have a much stronger taste and will add more flavor to the filling). As for the asparagus, I chose the small and thin variety which cooks faster, is more tender and has a stronger yet slightly bitter taste. You can also use the thicker variety cutting it in thin strips. 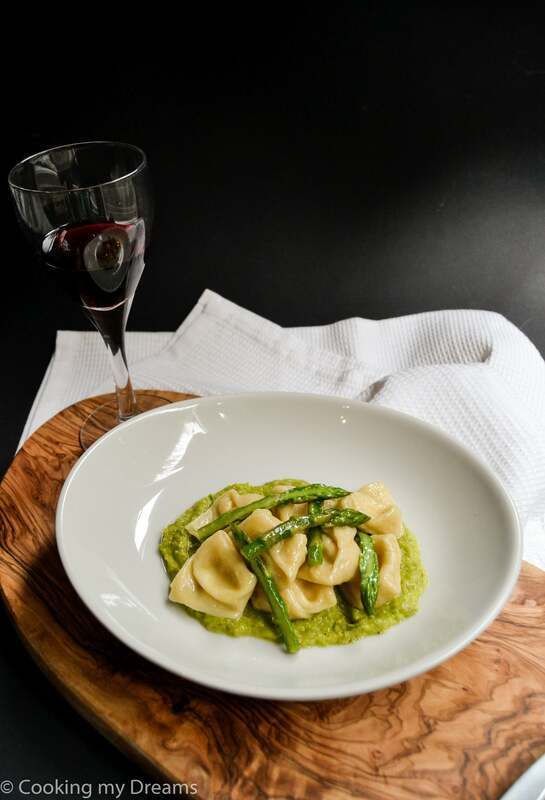 To give Cappelletti its traditional shape, roll the pasta dough into a thin sheet and cut squares of about 7 cm per side (about 2 inches). Place a teaspoon of filling in the middle of the square then brush the sides with a little bit of water. Fold it into a triangle pressing well the sides so they won’t open while boiling. Fold the side corners toward the center and press them to close the shape. Mix the flours with the eggs with your hands and knead it until you get a smooth ball of dough. Cover it in foil and let it rest for about 15 minutes. Meanwhile prepare the filling, mix the Ricotta with the Parmesan cheese and add a pinch of salt and ground nutmeg. Make the Cappelletti following the instructions in the post above. 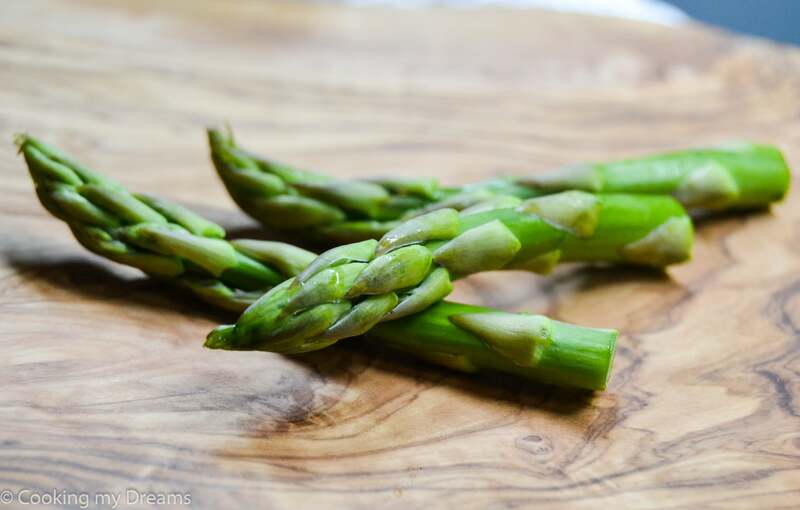 Wash the asparagus, trim the ends and cut the tips about 10cm (4 in) long. Chop the remaining part of the asparagus and boil it for 5-7 minutes until soft. Blend them with olive oil, salt and pepper until you get a smooth cream then set it aside. Cut the tips lenghtwise and blanch them in the boiing water then plung them in iced water to keep their vibrant color. 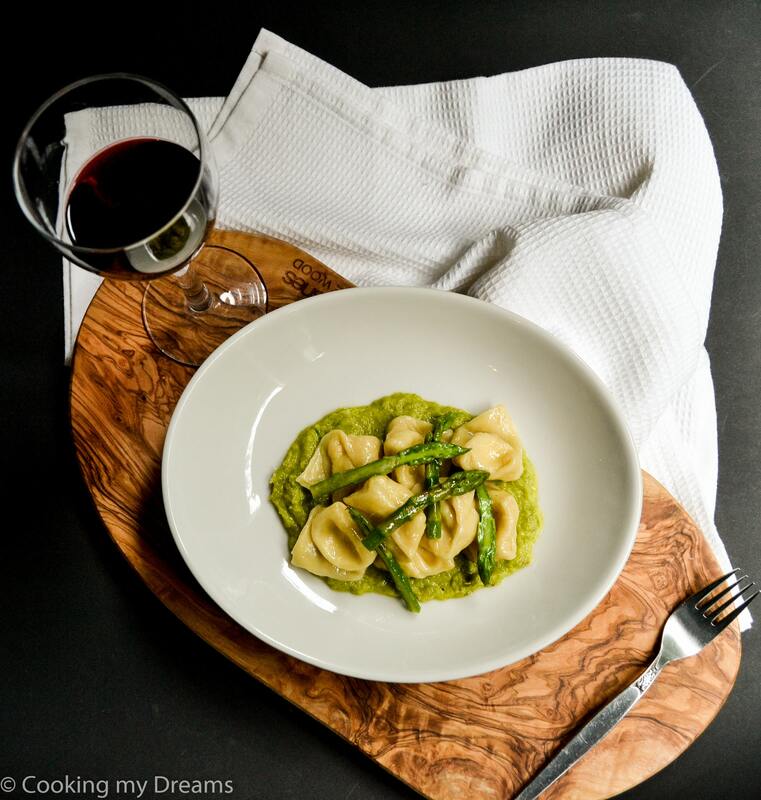 Boil the Cappelletti in salted water for about 3-4 minutes, meanwhile melt the butter in a pan and then toss in the Cappelletti, the asparagus tips and a tablespoon of Parmesan or Pecorino. Pour the asparagus sauce on the plate and then add the pasta with the tips on top. Serve immediately. If you like it (unfortunately I don't) you can add a few slices of truffles on top before serving.